In the introscope an object is scanned layer-by-layer with a fan-shaped X-ray beam. A line of scintillation detectors is used instead of the X-ray film. The shadow image of defect is observed on the monitor of the operator workstation. Compared to the radiographic inspection, the introscopic one offers higher efficiency and lower operating costs. The introscopic method is effective when testing objects with thickness up to 350 mm (for steel). operator workstation with a software. 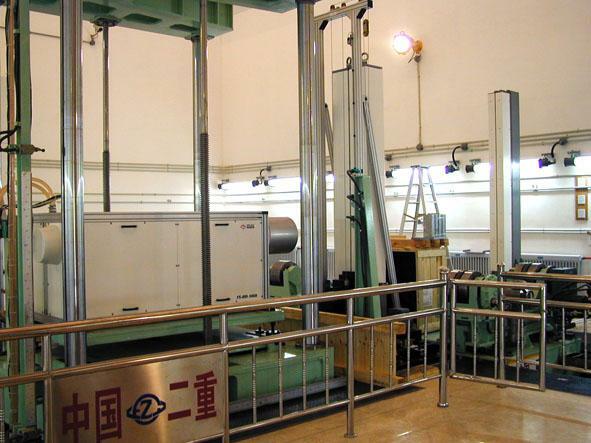 he collimation system is intended for beam forming. It consists of three collimators. The primary collimators installed on the radiation source, secondary collimator placed in front of inspected object and collimator placed in front of the detector line. The systems forming vertical and horizontal beams have been developed. The positioning system is intended to ensure linear travel of an inspected object perpendicular to the axis of the fan-shaped beam. To change the angle, the inspected is rotated in the beam plane. 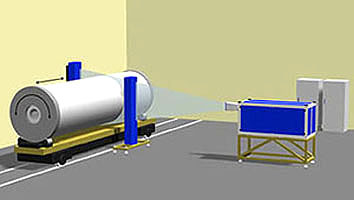 The object positioning is ensured with automated control system. 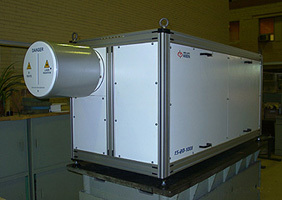 The measuring element of the detector system is the detector line placed behind the last collimator. The detector line transforms the recorded photons into electrical signals transmitted to the operator workstation after preliminary processing. The software is used for preliminary processing of data and their digitization and visualization. The computer workstation allows to reconstruct the object shadow image with a subsequent analysis of detected defects. Upon detecting a defect an operator can localize and zoom up the fragment to have better opportunities for the defect sizing and spotting.